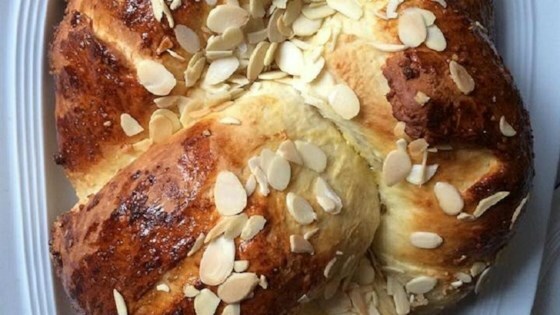 "This marzipan tubular bread is an ABSOLUTE must for the Christmas season, and a traditional dinner would not be complete without this Christmas Kringle for dessert. It may seem complicated at first glance, but if you follow the recipe step by step, it is actually quite easy and you will amaze your family with this beautiful dessert. This is an extremely rich and decadent treat so guests only need a little. Often a coin is hidden in the kringle and it is thought that the finder will be guaranteed good luck for the upcoming year. As such, it is considered bad luck not to indulge at Christmas!" Will not make again. Dough was too hard to roll out. Instructions were not good or complete. This bread is very, very good. I've made it twice now and it's gotten easier each time. I recently made it for a Christmas party and everyone LOVED IT and wanted the recipe!!!!! I'm still trying to figure out how to get filling in a 2in.wide strip.